Extreme Pump Formula is the combination of amino acids increasing the level of nitric oxide, which will fill your muscles with blood and perfectly nourish them. Impressive vascularization and muscle volume during exercise may be achieved with this preparation and also training effectiveness may be improved. L-Arginine – relatively exogenous amino acid, which is the precursor to nitric oxide (NO) – gaseous hormone with the effect of loosening smooth muscles of blood vessels and intensifying anabolism. When used before training, it may intensify blood flow to exercised muscles providing higher amount of oxygen and nutritious substances. It influences the decrease of blood pressure and may improve general fitness. L-Citrulline – another amino acid, which in turn converts to arginine. As research shows, it may increase the level of arginine in blood even more effectively than sole arginine in the longer time unit. We obtain more stable and stronger effect from the combination of these amino acids. It may also lower muscle pain appearing the day after training. Focus & Regeneration Formula combines the ingredients improving regeneration possibilities of muscles and mental efficiency in order to increase concentration during training and achieve the most efficient mind-muscle connection. Beta-Alanine – along with l-histidine it creates a dipeptide, carnosine. This substance in turn is known especially in the environments, which strive for longevity, because of its pro-health benefits. Sportsmen willingly use beta-alanine as a supplement improving endurance. Because of the buffering effect of carnosine, it may decrease muscle acidity, which means lower pain and the ability to perform a few additional reps.
Taurine – sulfuric amino acid demonstrating psychoactive effect and supporting the performance of sportsmen. It influence the work of pancreas and glycaemia, increases the strength of heart contraction and enables fat emulgation in the digestive tract. It influences central nervous system by GABA receptors agonism in the brain. It demonstrates the synergy of effects with caffeine, by the reduction of its side-effects. It conduces regenerative processes and facilitates the transport of nutrients to muscles. L-Tyrosine – the component used by the organism to build catecholamines – neurotransmitters with stimulating effect, such as adrenaline, noradrenaline and dopamine. It is often used as nootropic supplement in order to improve energy, concentration and motivation. It is also a precursor to build thyroid hormones, which influence metabolic rate. Energy Kick Formula increases the efficiency of the nervous system by reducing fatigue and putting the organism in the state of readiness to act. With a more effectively functioning nervous system, we are able to perform much harder and more intensive training than usual, ensuring at the same time stronger stimuli to develop our body. Caffeine – a substance from the group of methylxanthenes, abundantly appearing in coffee beans. It is known for its energizing effect and the improvement of the abilities of the brain and body. It owes its beneficial effect to the interaction with the adrenergic system and adenosine receptors, thanks to which it simultaneously stimulates and does not allow the feeling of fatigue. It widens bronchial tubes and facilitates breathing. One of the supplements with the best-documented ergogenic effect. Guarana extract – guarana is a grain coming from South America, which is characterized by the high content of caffeine (higher than in coffee) and other substances from the group of methylxanthenes. It is characterized by slightly longer and more stable effect in comparison to caffeine anhydrous. It supports the work of the brain also thanks to the remaining phyto-compounds, which are contained in it. It may inhibit the feeling of hunger to a certain extent. Extracts from plants and seeds – thanks to their extraordinary properties, they perfectly supplement the effect of the whole product. They increase the assimilability of the remaining ingredients, adding at the same time the package of additional effects related to endurance and health. Barley extract– provides vitamins and minerals, has alkali-forming properties and anti-inflammatory effect. It may increase the willingness to perform training, influences concentration and lowers physical and mental fatigue. Cayenne pepper extract – has thermogenic effect, increases the amount of heat dispersed in the organism, by which it intensifies the utilization of energy substrates and may contribute to faster loss of fatty tissue. It may improve immunity and lower cholesterol level in blood. It also contributes to inhibiting the process of fat cell growth. Black pepper extract – piperine contained in black pepper influences the improvement of assimilability of many nutrients. It demonstrates thermogenic effect, thanks to which it may positively influence the pace of fat reduction. It has antioxidant, anti-inflammatory and antibacterial effect. Northern firmoss extract – a plant classified to the family of Huperziaceae, which contains in its composition alkaloids, flavonoid glycosides, organic acids and phytosterols. It has antimicrobial, anti-inflammatory and anti-allergic effect. It influences physical and mental stimulation and contributes to the improvement of concentration. The profile of the activity of the whole product is decidedly beneficial to sportsmen aiming at achieving maximal training effectiveness by the complex influence on the whole organism. Knockout 2.0 is based on well-known and safe products and their composition, thanks to the synergy of effects, may move our sports results to a new level. 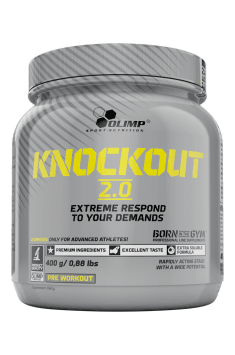 Olimp Knockout 2.0 is recommended to sportsmen at all proficiency levels in order to improve effort abilities of the organism, increase training volume and cause more effective muscle regeneration. Acidity regulator - citric acid; anti-caking agent - silicon dioxide; aromas, sweeteners - acesulfame K, sucralose, cyclamenes (Z); dyes - carotenes (A), cochineal (B), riboflavin (C), E 150c (D), E 150d (E), E 133 (F), patent blue V (G), indigo carmine (H), chlorophylls and chlorophyllins (I), curcumin (J), anthocyanins (K ), pepper extract (L), betanin (M), vegetable carbon (N). BCAA powder supports the synthesis of proteins, reduces catabolism, and increases strength and endurance.